From places to stay to where to eat on Smith Island, check out www.visitsmithisland.com. 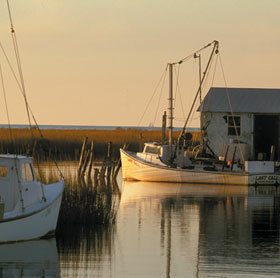 Click here for a list of Practical Tips for Your Visit to Smith Island. Passenger ferries leave twice daily to Smith Island from Crisfield, MD. The Captain Jason and the Island Belle head to Ewell and the Captain Jason II goes to Tylerton as well as Ewell. All ferries leave at 12:30 PM and 5:00 PM from the city dock, where MD 413 dead-ends at the water. Return trips from the island are at 7:00 AM and 3:30 PM. The ride takes 45 minutes to an hour. The ferries transport everything to the island, and they will carry kayaks for a small fee. 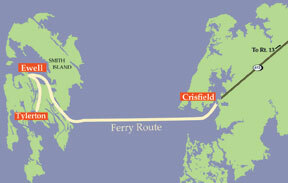 Special runs can sometimes be arranged in advance with the ferry captains for a charge. During the winter and early spring months, it is best to check with the ferry captains to make sure they will be running. One can easily get around Tylerton on foot. Bicycle and golf cart rentals are available near the county dock in Ewell. Rhodes Point is two miles from Ewell and the two villages are connected by road. One can paddle between Tylerton and Ewell or Rhodes Point. Arrangements can also be made with the ferry captains to go between Tylerton and Ewell. In Ewell and Tylerton, one can find bed and breakfasts and house rentals as well as traditional island fare for lunch. These villages also have small markets where essentials and more can be purchased. Some island services are seasonal. Please visit www.visitsmithisland.com for more information about lodging, restaurants, shops, fishing, kayaks, bike rentals, the visitor's center, the Smith Island Crab Co-op, ferries and church services. For more detailed information about visiting Smith Island, check out www.visitsmithisland.com.